Scarlet Hill Farm sits on 134 acres in Groton, MA - northwest of Boston. The grounds offer ideal conditioning for horse and rider with many hills, open fields and access to an extensive trail system. More than a mile of slip-board fencing encloses lush pastures where horses graze all day and a lucky few all night as well. We turn out primarily in small friendly groups, though the few who need it have paddocks to themselves. 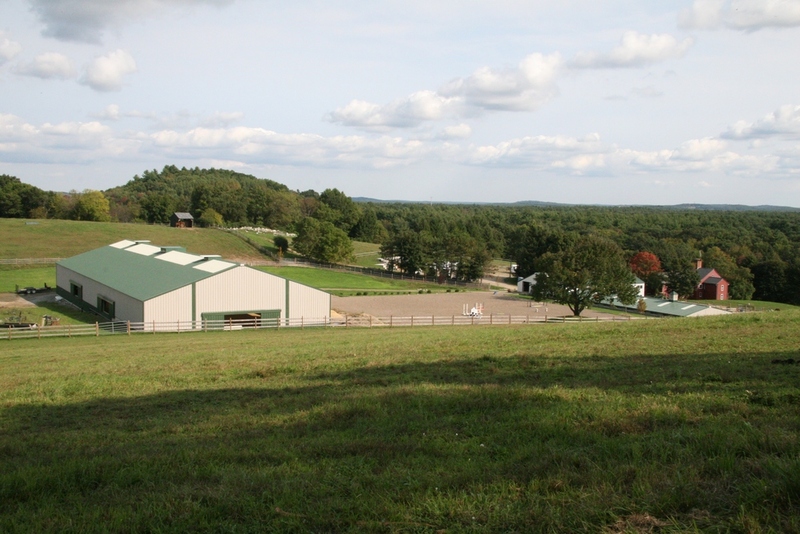 We have a stadium jumping field and a cross-country course with a broad variety of terrain and spectacular views of Boston to the Monadnock Mountains. The barn is new with airy, well ventilated stalls, all with windows. Grooming and care takes place not in a busy aisle, but in a well-lit grooming area. Weekly lessons or training are required of boarders. Other use of facilities is included in board.